No matter the size of your development program, data can be your strongest ally and most valuable asset. It can verify if your programs are headed in the right direction and where your team can make changes for greater success. Using data the right way also increases credibility with your C-suite, makes a compelling case to donors and sets clear expectations and goals for staff. Each year, AHP surveys members and non-members alike to put together the most comprehensive charitable giving evaluation for health care philanthropy and fundraising. Hospital and system foundations across the country participate in a short or long survey process. 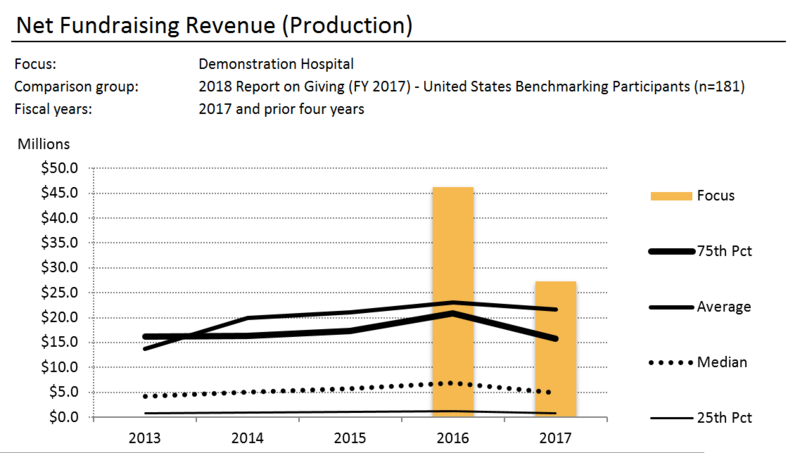 The results from these yearly disclosures are summarized in AHP’s Report on Giving. This report allows your organization to see consolidated industry benchmarks and match your performance against other hospitals in your country. AHP produces separate studies for Canada and the US. First time participating? Sign up to participate in this year's survey. Returning from last year? Click here to go to the survey platform. What is the Report on Giving? The Report on Giving is a publication that pulls data from a survey that AHP conducts on an annual basis. It is open to participants from any healthcare entity or system that raises healthcare related funds. At the end of the year, a full report is published on the survey findings, including summary data on total funds raised, return on investment, cost to raise a dollar, and other key industry metrics. To get a quick overview of the 2018 Report on Giving, read our by the numbers article in AHP Connect. AHP also has a step-by-step guide to walk you through every survey question. No matter the size of your philanthropic program, data is one of your strongest allies and most valuable assets. AHP’s Report on Giving uses data to verify if your programs are headed in the right direction and where your team can make changes for continued success. A free performance scorecard, including key fundraising efficiency metrics like return on investment, cost to raise a dollar, and net fundraising revenue. Access to customizable comparison groups with ability to customize by variables like entity type, bed size, direct staff numbers, net operating revenue, expense budget, and more. Benchmarking allows participants to create comparison groups based on the data available from each year of the survey and analyze their own data against their peers’. Participants receive a free performance scorecard with key fundraising efficiency metrics and have the option to upgrade to benchmarking subscriptions for more data access: either at a basic or an advanced level. Click through below to view samples of each report. For an additional consulting fee, AHP staff are available to generate custom reports for you and create slideshows for your use. Email us to request more information about customer services. AHP hosts free webinars to walk through the platform and survey process step by step, view sample benchmarking reports, and hear from experienced users on how they use their data. View our schedule for 2019 on our webinars page. Want to hear from experienced users? Listen to their stories on using benchmarking data, either from a chief development officer’s perspective or from an operations professional’s perspective. You can also check out the AHP Connect articles on 4 Common Problems Data Measurement Can Solve and 5 Common Misconceptions About Benchmarking Data. View a list of participating organizations or our high performers from the 2018 Report on Giving.